Google+ Circles allows you to group people in to different categories related to your life. In Google Plus there are various ways to create a new circle today I will be showing you the simple way to add a custom Circle on Google+. Step 1: Log-in to your Google+ account and go to the Circles Section of Google+ by clicking Circles icon in the top menu. Step 2: Click on Drop Here to create new circle and after that click on Create a new Circle. Step3: Now you will get a Popup window where you have to add the description of your new Circle. Now you will get 2 Options to create a circle.One anEmpty Circleanother one filled circle. Empty Circle means a Circle that does not have any members into it andFilled Circlemeans a Circle with at least one member. Here I’m Creating anEmpty Circle. 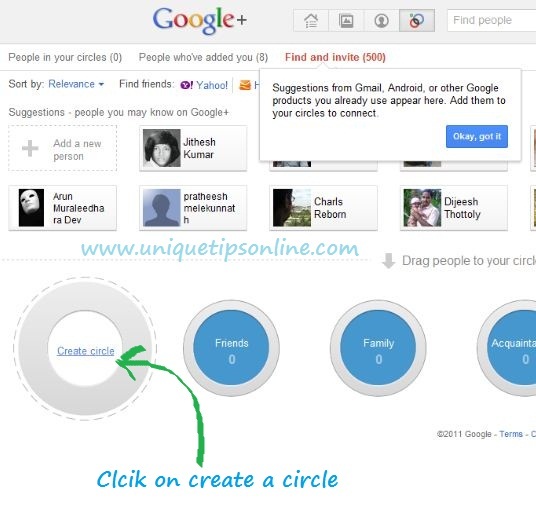 Step 4: Once you click on “Create Empty Circle” Google+ will create new custom circle of your choice. Step1: Log in to your Google+ account and click on Circles. Step2: Now open on your custom circle and click on add new person. Step3: Done! Type your person name or his email address in order to add that person in to your custom circle. Once a person is added to one of your circle, you will receive instant stream updates from him on your Google+ profile.